Factory Order. Delivery is estimated to be eight weeks. The smallest in its class. Built-in Power supply and Automatic Antenna Tuner. Dimension: L 38, H 18.3, P 43 cm (14.96” W, 7.20” H,16.93” D) (connettors included). Two powerfull CPUs are used. 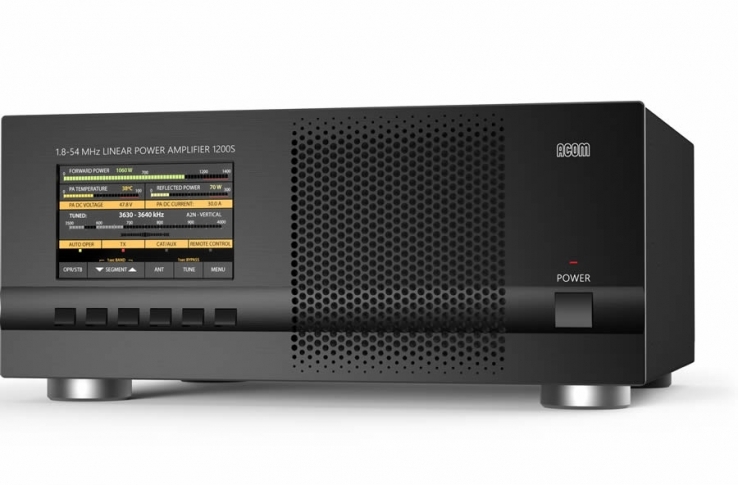 Over 35,000 lines of software for performance that cannot be found in any other amplifier. Easy connection with all models “ICOM, YAESU, KENWOOD, TEN-TEC, FlexRadio ELECRAFT” for immediate management of the bands, tuner and antennas. Same performance with all makes or homemade rigs. The operator has only to move the “Frequency Tuning Knob” in the transceiver!!! 1.8 MHz to 50 MHz including WARC bands. Up to 2 KW pep SSB, CW out; 50 MHz included. MAX / MID (1KW) / LOW (500W) power selected according to the operator SSB/CW power requirement, for digital modes and for linear protection (automatic). No heating time, immediately ready! Virtually limitless life of the amplification devices ((6 MOSFETs MRF151G). 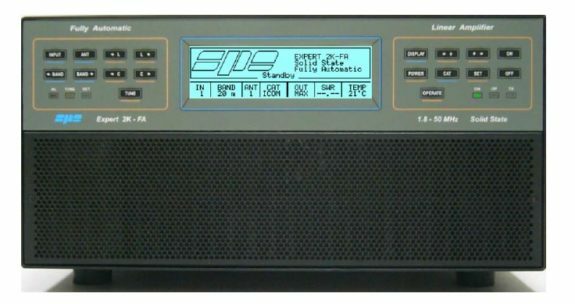 Capable of matching 3:1 SWR on HF, and 2.5:1 SWR on 6 meters. Capable of programmable switching of 6 antennas (SO239 connectors). Up to 3 antennas for the same band. Management of the SteppIR / Ultrabeam antennas (tuneable). Measure also the SWR of the antenna / cable system. Bands, Antennas, Tuning conditions are changed in 10 msec. Bands, Antennas and Tuning conditions are managed also in “STBY“ to support the exciter only. High power gain (up to 14.5 dB). In “OPERATE“ the required drive power is automatically set with an ALC connection and in “STANDBY“ the exciter is then automatically reset to full power. Very clean and low distortion output! Spurious emissions less than -60 dB ( 50 MHz –65 dB ). 3rd order distortion (two tone test) 36 dB typ. Temperature, Over-Voltage, Over-Current, SWR, Reflected Power, Max RF Tuner Voltage, Over-Drive, Amp. The correct parameters are continuously monitored. · Via hardware circuits (HW) to assure great speed. · Via the software (SW), to assure great accuracy. Thanks to the SW, transmit relay changeover is carried out with zero current at the contacts. Linear management of the speed of the cooling fans of the heatsink. In the power supply, fans speed is reduced during the reception. Since, considering the big power developed, a significant amount of heat must be removed, every precaution is used to keep the lowest possible the noise of the fans. “MAX” mode: SSB / CW unlimited. Automatically switches to “MID” for a while if, in “MAX”, a continuous signal (RTTY) is transmitted. “MID” “LOW” modes, RTTY unlimited. Continous input between 190 – 255 Vac, 47-63 Hz. The linear can be switched ON / OFF also switching ON / OFF the exciter. W pep out, V pa, I pa, W, Power gain, Temperatures, SWR (after and before the ATU), Input setting, CAT setting, Band and other indications including an alarms log. Powerful SW gives you a user-friendly unit. For new SW releases download. A sturdy carry-bag is supplied for “QSY, FIELD DAY, DX’ PEDITIONS etc.“. SPE sales are now handled by LAM Communications, as well as their warranty. If you bought an amplifier from Vine Antennas, and it develops a fault, we are here to look after you. Call us first to discuss the nature of the fault. We may be able to resolve the problem over the phone. If that doesnt work, then send it to us, and we will have it repaired and sent back to you as fast as we can. There will of course be no cost to you for Vine amplifiers still in warranty. Repairs outside warranty will be charged at our usual reasonable rates. SPE EXPERT 2K-FA The smallest in its class. Easy connection with all models "ICOM, YAESU, KENWOOD, TEN-TEC, FlexRadio ELECRAFT" for immediate management of the bands, tuner and antennas.